Quarterly growth has been remarkably steady for the last two years. Growth. Not growth rate. Little Mikey, sitting so low he can barely see over the table, stares curiously at the bowl. The camera cuts to the boys sitting up in excitement. “He likes it! Hey Mikey!” Cut to Mikey shoveling pieces of Life into his mouth. The implication is clear: if a picky eater likes the cereal, others will like it, too. By they I mean music consumers around the world. By it I mean the modern music subscription service. Around the world, an average of 175,000 people become subscribers each month (net 175,000, not gross). 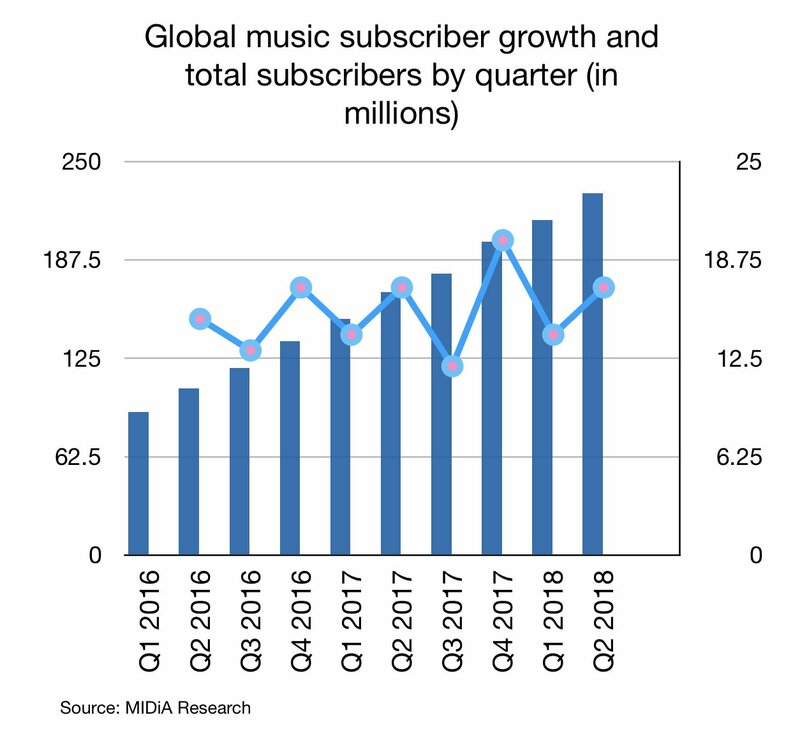 The United States accounts for a quarter of the world’s new subscribers, per the RIAA’s statistics for the first half of 2018. If picky music fans can subscribe to a music service, others can, too. More than a couple hundred million people like subscriptions enough to pay a monthly fee for unlimited listening to huge, curated catalogs. Setting aside widespread disillusionment in the artist community over streaming royalties — it’s real and important, but it’s a topic for a different day — the subscriber growth is pretty amazing. Recorded music revenues are rising almost everywhere in the world because of gains in streaming royalties. In just a few years, people have changed how they experience music and how they pay to listen. Download sales are falling down a steep hill at 20- to 30-percent declines in many countries (including in the United States). Streaming services are blossoming. Consumer appetite for services like Spotify and Apple Music is strong. Free services, namely YouTube, get the most traffic but pay fewer royalties than subscription services. Method 1: Quarterly growth rate as a percentage of total subscribers. This metric has dropped from 14.2 percent in Q2 2016 to 7.4 percent in Q2 2018. That’s almost a 50-percent decline. Of course, a growth rate will decline as the number of subscribers increases. A company could add customers at a torrid pace—in the triple digits—early in its history. But as the market matures, the growth rate will slow. This metric is commonly used in the media. Unfortunately, the reader isn’t always reminded of this natural, common change. Method 2: Quarterly growth in the number of subscribers. Focusing on growth rather than growth rate reveals how streaming companies, in aggregate, are coming along. If the number drops, either the companies are running out of potential subscribers and exhausting the addressable market, or they’re doing a poor job acquiring and retaining subscribers. 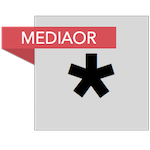 MIDiA’s numbers show that subscriber growth has been fairly steady over the last two-plus years. The quarterly growth in subscriber count has averaged 15.3 million from Q1 2016 to Q2 2018 and have ranged from a low of 12 million to 20 million. Most growth numbers are between 14 million and 17 million. Overall, subscriber growth hasn’t had any major hiccups. Rolling four-quarter subscriber additions are amazingly steady from Q1 2017 to Q2 2018. They are, in order: 59 million, 61 million, 60 million, 63 million, 63 million, and 63 million. So, over the last six 12–month periods, subscriber growth fell inside a narrow band of 59 million to 63 million. And growth is picking up: the highest four-quarter sum, 63 million, was achieved in each of the last three four-month periods. 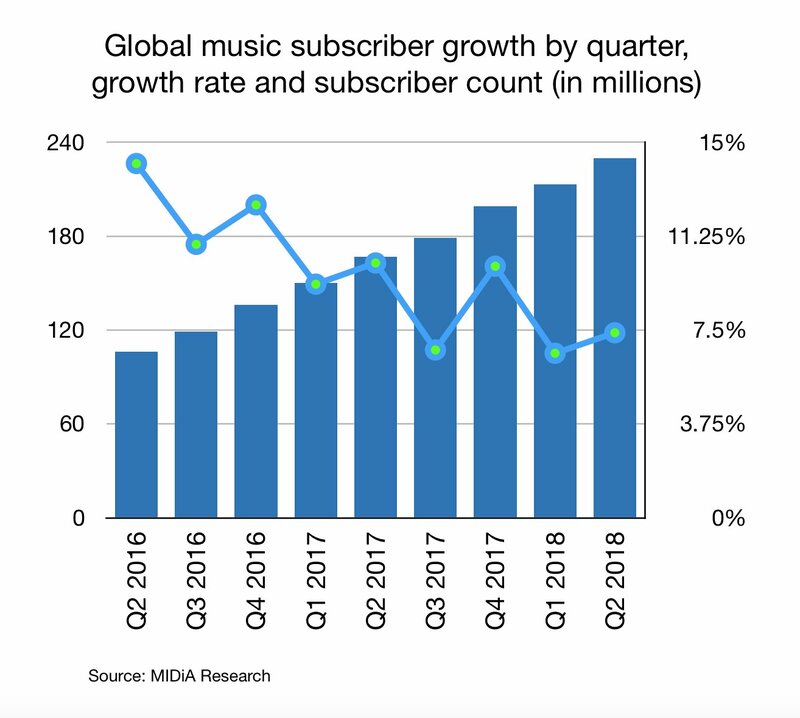 The $32-billion dollar question—the current market value of Spotify—is whether or not subscription services can continue to add 15 million or so subscribers each quarter. Yes, current growth will continue into 2019. Fourth quarters were strong in 2016 and 2017. There’s reason to believe Q4 2018 will also be strong, too. With the marketing pushes we’ve been seeing, Spotify, Apple, and Amazon are already in hot competition for new customers. Amazon will be able to capitalize on sales of its Echo smart speakers. Apple and Spotify—and Pandora—benefit from Echo ownership, too, because they people can download Echo apps and link the speaker to their accounts. But Amazon’s advantage is its quasi-captive Echo audience it can market directly to. Not that Amazon has a monopoly in the smart speaker market. The Echo’s global market share has dropped to 41 percent from 76 percent a year ago. Apple is selling its HomePod smart speaker (more expensive than Echo). Google, too, has a smart speaker, the Google Home (at about the same price as the typical Echo unit); Google Home has the second best global market share are 28 percent. The race for subscribers will leave a handful of leaders and a pack of hopefuls and losers. Spotify, Apple, Amazon, and Tencent, a Chinese streaming service with about 15 million subscribers (according to reports), are best positioned to claim nearly all the market share. Digital music is basically an arms race: the companies with the best technology, best talent, and more resources are going to win. Spotify CFO Barry McCarthy described the company’s approach during a conversation at Goldman Sachs’ Communicopia Conference. Data, data insights, engineering culture, and software will win the game, McCarthy predicted. Brand loyalty, switching costs, marketing, and advertising are vital factors, too. Services are not competing on price. Instead, streaming companies create value by adding product features, new content formats such as podcasts, and constantly improving the user experience. Unique features, like Spotify’s Discovery Weekly, can increase engagement and give the company the reputation as an innovator. Playlists are so vital that companies poor resources into curation and turn playlists into brand names (Rap Caviar is the best example.) When all services have the same content—with few exceptions—differentiation is, well, the difference between winning and losing. Some subscriber growth is going to come from outside of North America and Europe. The world’s emerging markets have post-piracy potential thanks to smartphones and mobile Internet. Whatever growth comes from emerging markets will have a lower average revenue per user because prices are lower (to match the country’s purchase power). For example, the monthly fee is $5 in Mexico versus $10 in the United States. The price differential makes sense given the difference in each country’s purchase power. But emerging markets are still valuable. A lower ARPU will matter less if services can attract a large number of subscribers in large countries such as Brazil and Indonesia. As I’ve pointed out, both countries have massive addressable markets because they have some of the largest populations in the world.